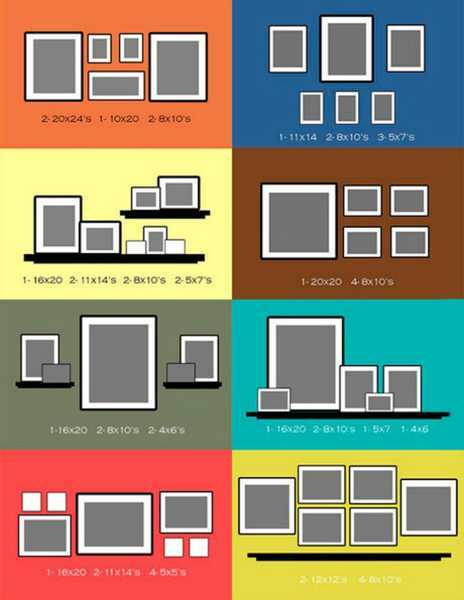 Here is a helpful collection of layouts for hanging photographs, empty frames or artworks. Pictures, paintings, quilts, and mirrors are beautiful home decorations that look very impressive individually and in groups. Wall decorations enhance an interior design and personalize room decorating. 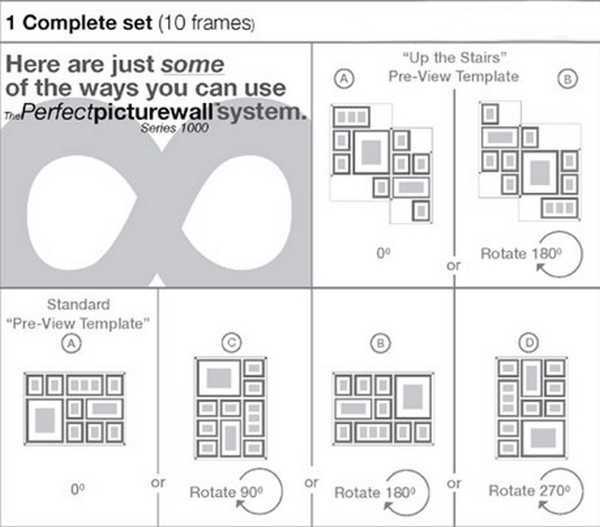 These layout plans can help you decorate empty walls like a pro. They show how to arrange photographs or art pieces and create attractive displays by adding stylish accents to wall decoration. Well designed layouts complement your home interiors and make your rooms look fascinating. 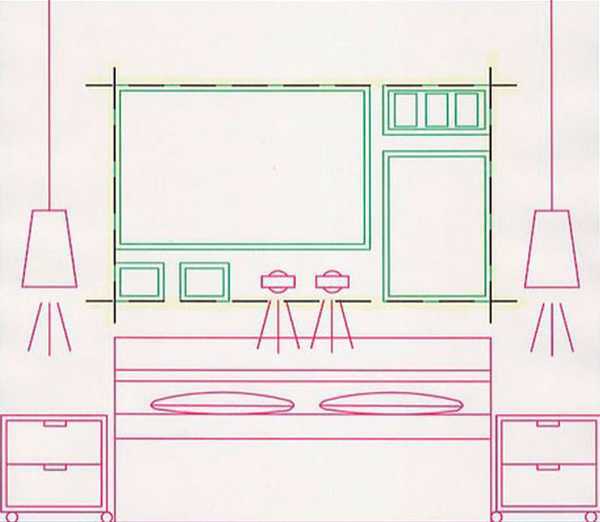 Wall decorations can cover the entire wall while keeping a room light and spacious. Beautiful collections of photographs, crafts or artworks are excellent decorating ideas for empty walls. 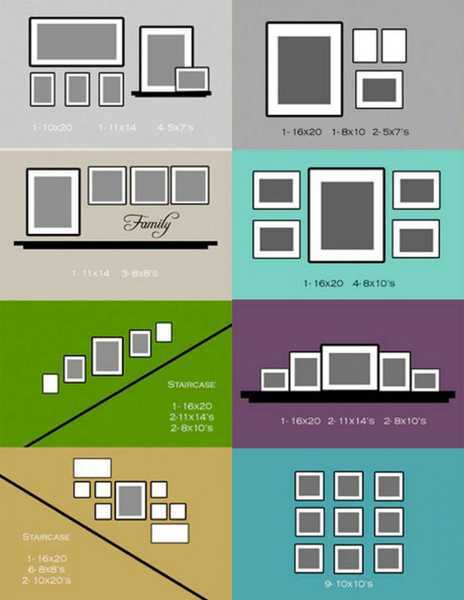 Empty picture frames create fabulous wall decor while helping declutter homes and design modern interiors. Big wall surfaces can handle significant collections of photographs, large photos, frames, and art. Single small pictures on empty walls look unappealing. It is better to create impressive compositions by grouping small photos and arranging them in a creative and unusual way. 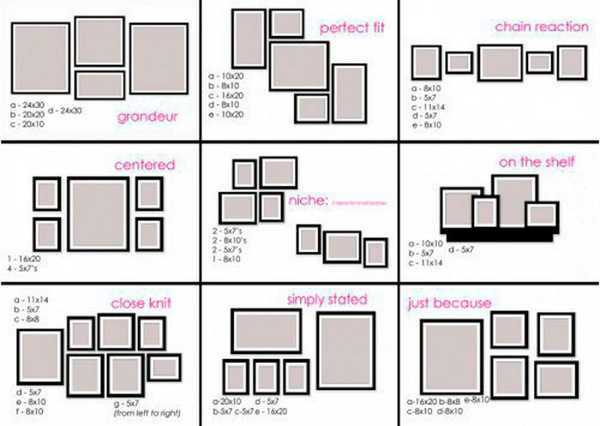 The layout plans below provide inspirations and demonstrate how to hang photographs. 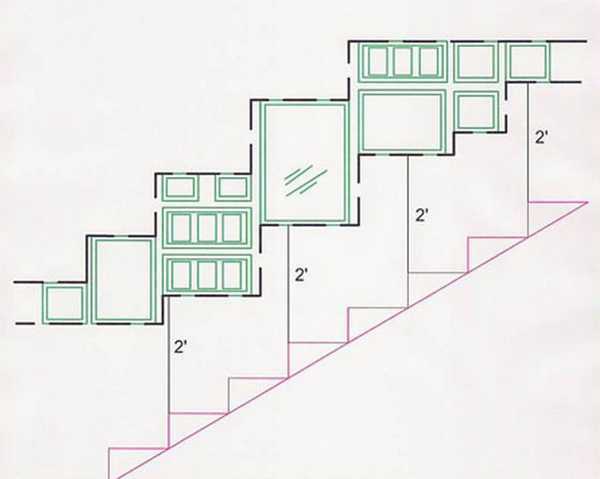 Following one of the plans, you can decorate each of your empty walls like a professional decorator. Wisely arranged, a collection of photographs allows each item to be seen. 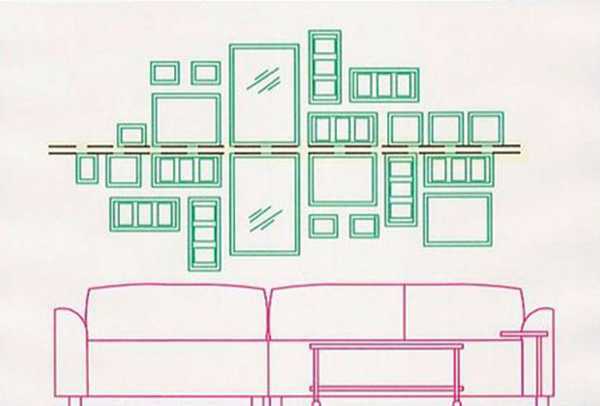 Smart arrangements create interesting room decorating and give a character to empty walls. 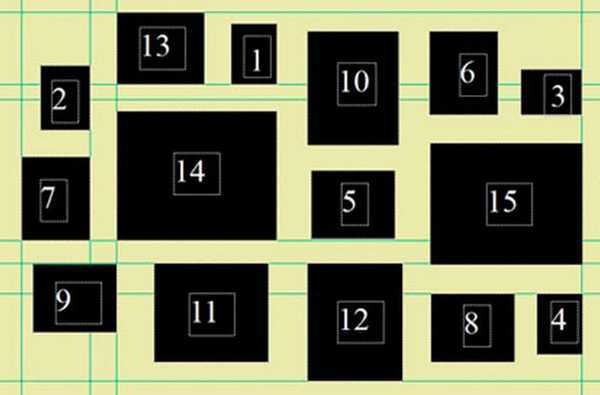 You can group photos by sizes, frame colors, shapes or themes. You can create a collection of happy or sad faces. The only thing is you have to hang the items at the eye level to get your beautiful pictures noticed. 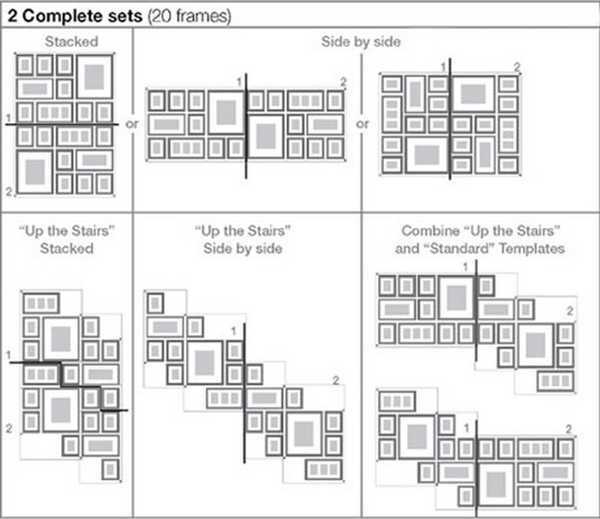 Use the basic rules and elements of good composition, – the symmetry, axis, golden section, and golden ratio. Use an imaginary axis of symmetry to place your photographs and create a spectacular wall decoration in style. The axis can be either parallel or perpendicular to the floor, inclined roof, triangular shaped windows or stairs. Also, you can imagine a diagonal line if you do not have a structural reference and use it for creating symmetry. Balanced compositions of pictures, frames, crafts and artworks complement interior decorating. 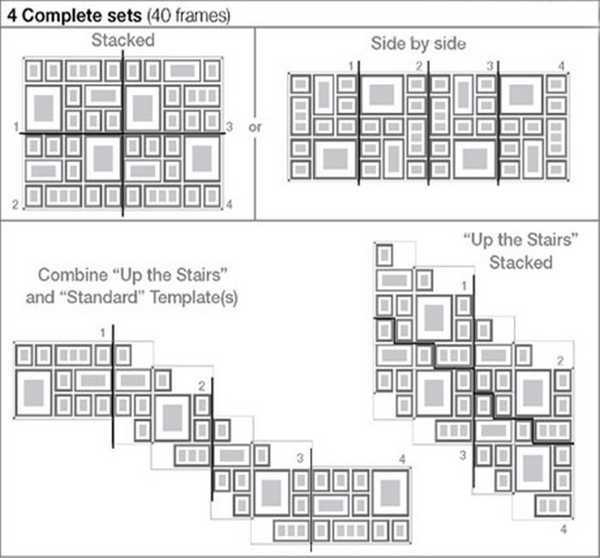 These wall decorations bring rhythm and repetition into living spaces and harmonize them. They add engaging themes and enhancing accents to your home interiors. 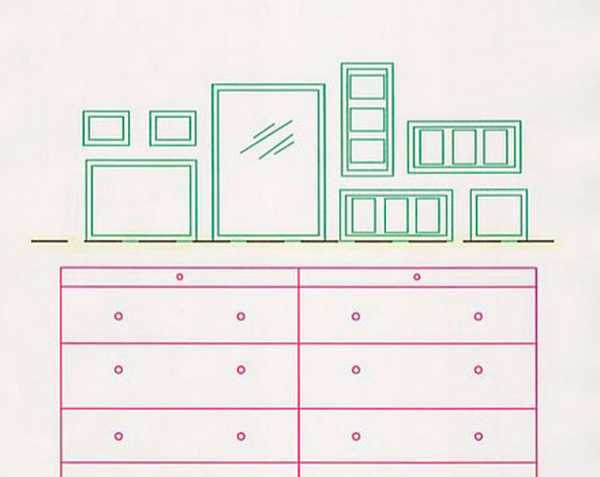 Create an arrangement of your decorative items on the floor first and see if you like the layout plan. 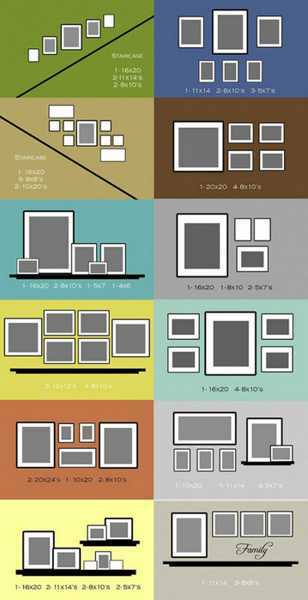 Make some changes or try a different composition before you start to decorate your wall. 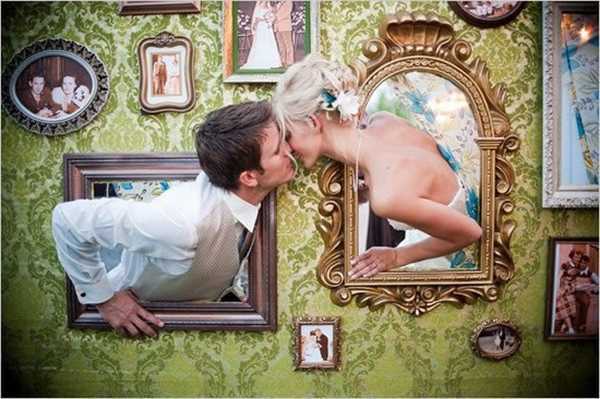 Be creative and blend unusual items, like mirrors or tapestries, with photographs, crafts, and art. It adds a whimsical feel to your beautiful displays and helps dress up your empty walls in modern style.